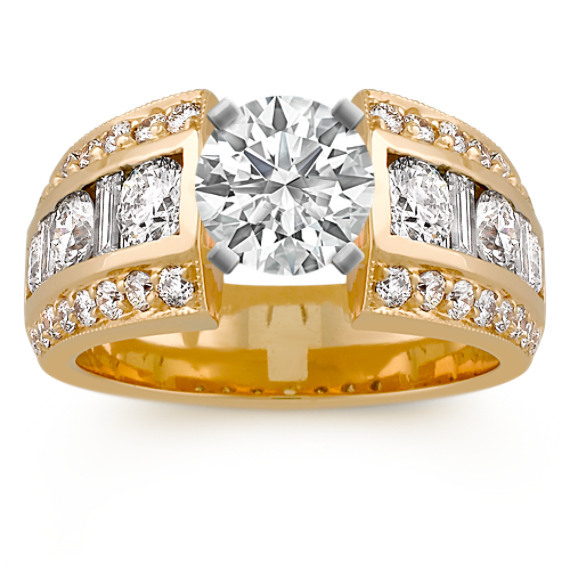 Round and Baguette Diamond Engagement Ring in Yellow Gold | Shane Co.
Sophisticated elegance defines the look of this dazzling diamond engagement ring. Thirty-eight round diamonds, at approximately 1.44 carats TW, and four baguette diamonds, at approximately .28 carat TW, come together to form a unique and distinctive look. These hand-matched stones are channel-set in superior quality 14 karat white gold with an approximate total gem weight of 1.72 carats. Simply add the center stone of your choice.